This pattern shows basically the same sock in three different versions. The difference in the three is the center stitch used in the larger areas. 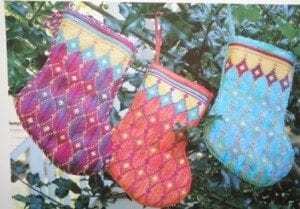 It is stitched on 18 count canvas with a 8″ by 10″ piece for each sock. The threads suggested are Snow, Soie Cristale, with a background of Watercolours or Waterlilies. The colors shown are an overdyed grape, orange, or sea blue but you could change them to any color you choose. The six page chart has easy to follow diagrams (done in color) and instructions. As a trio or individually done, these would be a nice addition to any Christmas tree.